This post is so long over due, it's not even funny! And yay! You finally get to see a finished project! I know, I know, it's not Nuvem. I'm sure a few of you were expecting Nuvem. Instead, I'm showing you socks. 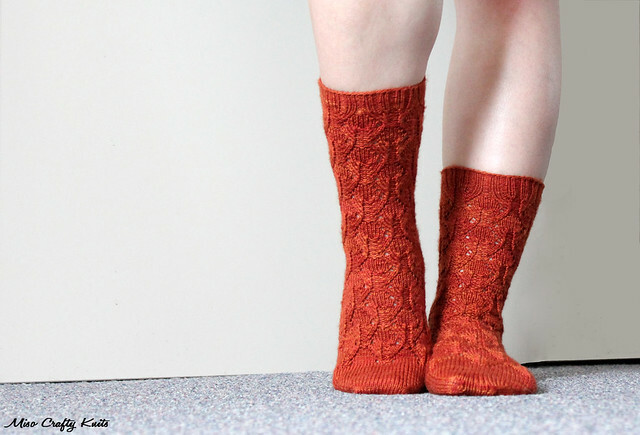 Beautiful socks knit up in a gorgeous colour. Last October I got the fabulous opportunity to test knit this sock pattern by Felicia Lo, the founder/mastermind of SweetGeorgia Yarns. When I saw the pattern I knew immediately which yarn I wanted to use (Tough Love Sock, of course!) and in what colour (Cayenne). Strangely enough, I picked the exact colourway that Felicia had used in her sample socks. I had originally bought this colour to knit up a Georgia cardigan just like Jane's, but realized shortly after the purchase that the colour so close to my face would make me look a little on the sickly side. Why is it that the colours you love the most are the ones that you can't pull off? Or is that just me? Anyhoo, I love the colour and had marvelled at all the different tones within the colourway every time I pulled out the skein that I didn't have the heart to just cast it aside. Knowing that I would most likely use it for socks, I stashed it away in my special SweetGeorgia chest of drawers (don't give me that look! ), just waiting for the right sock pattern to come along. Well wouldn't you know it, that time has finally come! I give you the Park City Socks! I had knit the first sock within a week. I have no idea whatsoever if I had anything useful or even remotely helpful to contribute to the test knitting panel, as my sock knitting skills aren't anywhere near as experienced as the other testers. I wouldn't call myself a beginner, I'm definitely not at all advanced, but don't feel like I'm at the intermediate level either. I'm guessing that if I could knit this pattern, then anyone can. The pattern calls for intermediate skills, but since it includes both a chart and written instructions for the lace, I think even an advanced beginner who has knit up at least a pair of plain socks beforehand could give this pattern a go. The lace design is easy but still interesting enough to keep you on your toes (no pun intended). The socks are knit from the top down so you become a pro at the lace pattern by the time you get to the instep, which really helped me out on the first sock (I was trying to fudge my numbers to accomodate for my narrow heels and wide toe box...I think my feet are weirdly shaped...like hamster feet or something). The second sock I had ripped up and re-knitted after the pattern was finalized. Just so that I could get see the difference between the original and final pattern - but you really can't tell between the socks which is the test knit and which isn't. The pattern is so awesome that I managed to knit up the second sock in a matter of two days!! I took a break from Nuvem to knit on this sock and boy, am I glad I did...these socks kick started my knitting mojo right back up!! Woot woot! My most favourite thing about these socks: the heels. I absolutely love how these heels are constructed. There's no wrapping and turning, no having to remember the steps in which to hide the wrap, and most importantly - no gaps!! I have nothing but pure love for how you turn the heel on these socks, that I just might have to use this technique on the next pair of top-down socks that I knit! It's simply genius! This pattern is a quick and gratifying knit that ends with such beautiful results. A definite must-knit for those who knit socks!